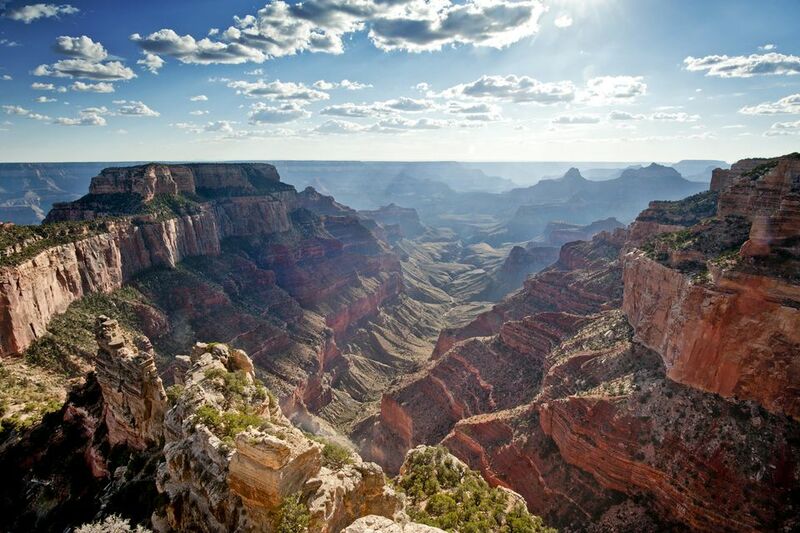 About five million people visit Grand Canyon National Park each year and it comes as no surprise why. The main attraction, Grand Canyon, is a mammoth gorge stretching 277 miles showcasing amazing depths of colorful geology. It boasts some of the nation’s cleanest air and a great deal of the park’s 1,904 square miles are maintained as wilderness. Visitors cannot help but be blown away by stunning views from almost any vantage point. Created by the Colorado River over a six million year period, the canyon ranges in width from four to 18 miles and reaches depths of 6,000 feet. Its breathtaking geology reveals nearly two billion years of the Earth's history exposing layer after layer of rock while the Colorado Plateau was uplifted. First given Federal protection in 1893 as a Forest Reserve, the area became a National Monument, and in 1919, became a national park. President Theodore Roosevelt was a key advocate in preserving the area, and visited on many occasions to hunt and take pleasure in the landscape. South Rim is open year-round, while North Rim closes certain facilities from mid-October to mid-May. Deep snow is common from mid-November to mid-May. Summer month temperatures can reach 118°F, making spring and fall the ideal seasons to visit. For a private vehicle, the entrance fee is $25. For those entering by foot, bike, motorcycle, or non-commercial group, a fee of $12 per person is applied. Standard Park Passes, such as an annual pass, may be used at the Grand Canyon as well. Note: Camping fees are in addition to entrance fees. Backcountry permits are required for the following overnight activities: hiking, riding, cross-country ski trips, off-river hikes, some camping sites other than developed campgrounds, and winter camping. There are a variety of special permits available for the park. The canyon itself is the main attraction, but how you view it may differ. If the popular viewpoints are too crowded, the cannon offers trails to hike to the bottom, as well as mule rides, and scenic helicopter rides. Visitors may also enjoy white water rafting in the Colorado River, fishing, guided tours, star gazing, bicycling, or nature walks. There are notable lodges inside the park, including Bright Angel Lodge & Cabins, Kachina Lodge, Maswik Lodge, and Grand Canyon Lodge. (Get Rates) Phantom Ranch is located at the bottom of the canyon and prices include accommodations and meals. There are two developed campgrounds within the canyon that require reservations—Mather Campground on the South Rim and the North Rim Campground. Backcountry camping is also available with a permit. Wupatki National Monument, located in Flagstaff, lets visitors walk through remaining pueblos more than 100 years old. Just 12 miles outside of Flagstaff sits Sunset Crater National Monument, created in a series of volcanic eruptions more than 900 years ago. Walking though lava flows and ashes it's amazing to find trees, wildflowers, and even signs of wildlife. Even outside the park, visitors can enjoy the Grand Canyon.The Grand Canyon West Skywalk was created on land owned by the Hualapai Tribe and lets tourists walk onto a glass floor looking down some 4,000 feet to the base of the canyon.